A recent study found that remote workers achieved a 13 percent improvement in their performance as compared to in-office workers. Nine percent of that was achieved by working for longer periods while 4 percent resulted from more calls in the same time. Other than the productivity, work satisfaction and turnover improved as well. Remote working environments are now popular mainly because of technological advancements, changes in society and the economy. A remote work environment is enabled by faster reliable internet services, easy access through smart devices and laptops, as well as secure and affordable communication tools such as instant messaging applications. A remote working environment not only benefits employers but also employees. Employers can reduce overheads by having a talented remote workforce. As with cloud-based applications, these remote teams can share documents, videos or use teleconferencing for effective communication. Also, employers can attract talent by offering the option to work remotely thus having a competitive edge over companies with no such option. Remote workers are now able to perform job functions from any location worldwide saving a considerable amount of time. The new millennial workforce also values flexibility and prefers agile work practices that are offered by a remote working culture, thus improving overall employee satisfaction. With businesses having a remote group of workers scattered across the country and even the globe, remote teams can be effective only when the right systems and applications are implemented. We have built Office Chat to ensure that your remote teams are able to communicate effectively and you are able to build an excellent team of talented and hardworking remote workers. Though being in a physical office and interacting with co-workers in person is something that remote workers won’t be able to experience, with Office Chat you can create a virtual workspace/network. All of your employees – including your remote workforce – will be able to access this Office Chat network from anywhere in the world. With Office Chat groups, even remote workers can be a part of a team, department, project or group with ease ensuring that they have a sense of belonging. Office Chat groups also make certain that remote workers have access to the same resources as every other member of the group. Each group also has a group admin that helps business owners and managers lead and become more accountable when leading conversations that involve remote workers. 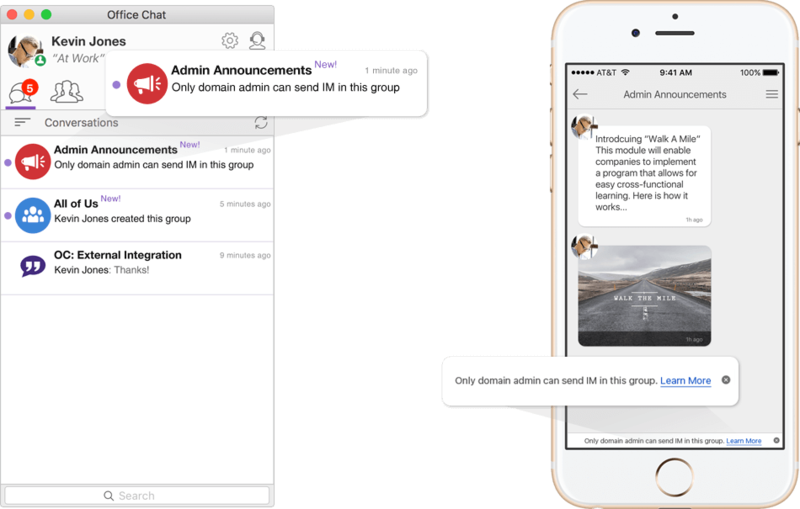 Office Chat private chats help you implement a virtual open door policy to help your remote employees. The private chat feature can be used by these employees to submit and report their work, interact with colleagues or seniors and ask for help or assistance. Any challenges or future strategies can also be discussed discreetly using private chats. Firms sometimes decide that remote working doesn’t suit their company culture. Often the reason is due to when remote employees are kept out of the loop from day-to-day happenings related to the entire workforce. Information such as new client acquisition, employee promotions, etc. are not timely shared with the remote employees and they often miss out on some important office-related news. With Office Chat, you can help your employees find work+life balance and still ensure that they are able to maintain their productivity. You can easily reach out to remote teams and freelancers by ensuring high accessibility from multiple Office Chat platforms such as desktop, smartphone and web browser. You can use the online presence, custom status and huddle features to stay connected with your team. Messages, files, groups and people can be easily searched within Office Chat. Despite any difference in time zones, your employees will have real-time flexibility that is not provided by emails. It is important that remote employees can connect and interact with other employees in order to be productive. Office Chat ensures that all employees are able to collaborate with ease avoiding any misunderstanding and eliminating communication barriers. 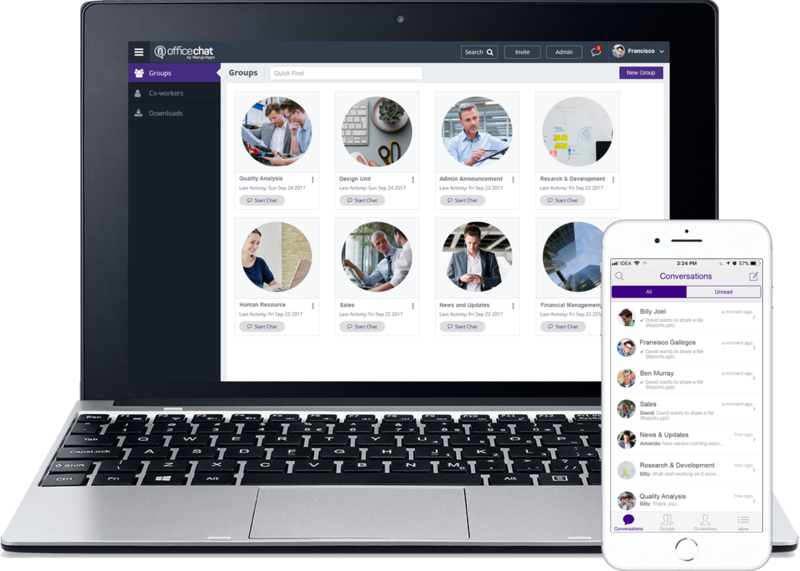 With Office Chat’s co-workers directory, remote users can view the list of active employees, view a profile snapshot of their colleagues and start a conversation with them. One of the advantages of having a simple and secure instant messaging application like Office Chat is that the feedback can be shared in a transparent and timely manner. Simply create a group to include only relevant users including remote workers to share ideas and brainstorm. Constructive criticism or feedback can also be shared with the relevant users using Office Chat. These ad-hoc groups also act as platforms for remote employees to showcase talents and skills that are not necessarily displayed during their daily activities. The Office Chat huddle feature helps you to conduct team meetings via video conferencing using third-party applications. These can be used to schedule online employee meetings so that your remote employees understand that they are a vital part of the organization. You can invite essential people only, set an agenda, end meetings on time and appoint presenters to keep the discussion focused during the meeting. Office Chat delivers proactive security, control and IT compliance over your company’s data. All messages exchanged and files shared on Office Chat are encrypted in transit (TLS/SSL) and at rest (256-bit AES encryption). With custom data retention and deletion rules, the admins of your company control how long you want your data stored. Remote device management can be used to disable or wipeout downloaded office chat content on mobile devices. Two-factor authentication (2FA) security drastically reduces the risk of online identity theft. User and access management can easily add, remove or investigate users through the admin portal. Office Chat features such as IP-based Access, Audit Logs, Security Logs, Device Management, Force Signout, etc. give you a secure, comprehensive access and control over your Office Chat network. If one of your remote employees loses his device, admins can disable the device using the User Devices feature. Also, the admin can remotely delete app data for the lost device, so that confidential company data is not compromised. As a domain administrator, you can make users using Office Chat on iOS/Android to compulsorily set a Touch ID/PIN as a security measure by enabling this feature. Remote Users can also themselves protect their devices from unauthorized access by setting a TouchID /Pin. Over the course of time, your remote workers will leave your organization. With Office Chat you can disable users from your network hassle free. You can simply deactivate or delete a user ensuring that he/she will not have access to your confidential data. Also with User Device Management, you can even disable all the devices that are associated with the user. Similarly, with the Remote Device Wipeout feature, you can easily wipe out and safeguard your official data remotely from the admin portal. We understand one of the reasons that you might have opted for a remote working environment is to allow your business to cater effectively to different timezones worldwide. In order to ensure that your operations run seamlessly, we offer 24×5 support through various mediums. Your workforce, including remote workers, can get in touch with the Office Chat support team via email, live chat, phone or contact us page on our website.